This DIY will walk you through how to build milk crate nesting boxes. 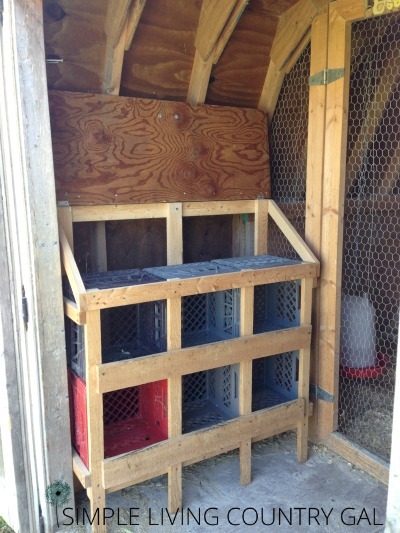 If you are new to chickens, you may not know what a nesting box is. It’s simple really. chicken nesting boxes are little “rooms” that a hen uses to lay her eggs in. 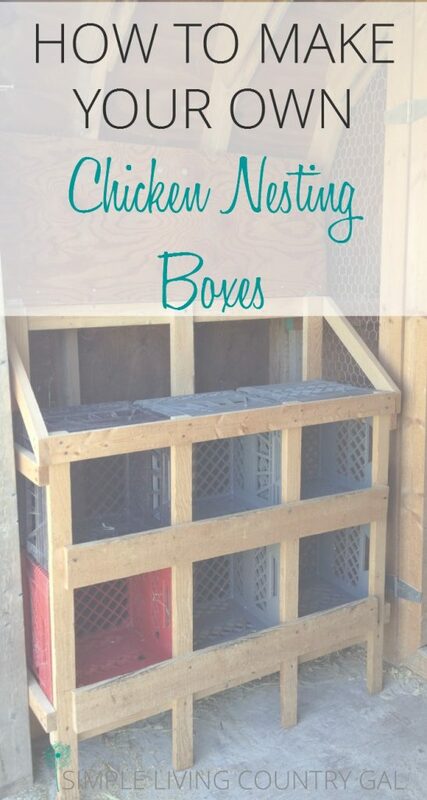 You can use just about anything to make your chicken nesting boxes. From wood to plastic. Store bought to homemade. 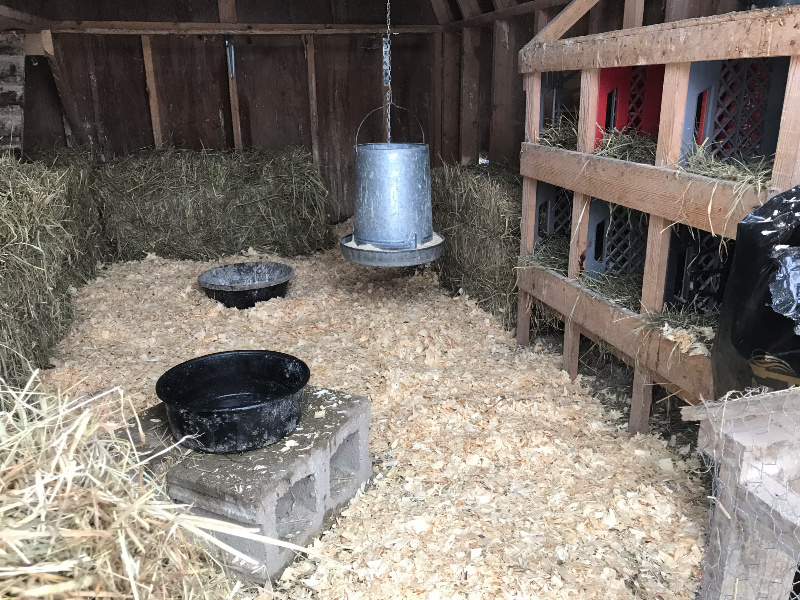 The trick is to find something that is sturdy, easy to clean, easy for the hens to get in and out of, and of course durable so it will last. When we first started raising chickens we had a small coop and that was fine. After just one year I quickly learned just how much I loved having those chickens and doubled the size of our flock. If you own chickens then you totally get that problem! Once we doubled we realized we needed a new home for our chickens and quickly got to work converting an old shed into a pretty awesome chicken coop. 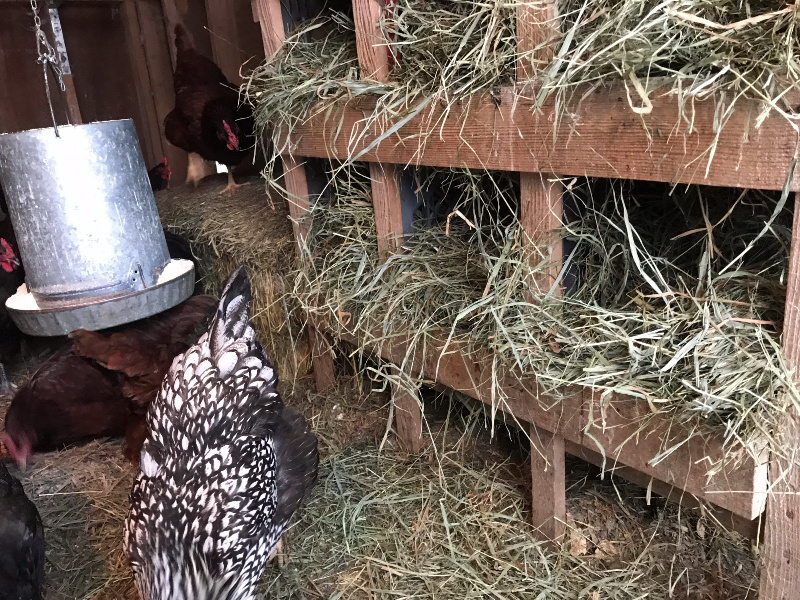 Once we had our new nice big home set up the next item on the list was to build a set of good and sturdy chicken nesting boxes. As you all know by now, I love to find new uses for items I have on hand. Before I could begin creating our nesting boxes, however, I needed to find some inspiration from my pals at Pinterest. Let me say there are some pretty resourceful chicken owners out there! I saw a few options that used empty kitty litter containers and a few more that built them out of pallet wood. I also saw a few using milk crates. I showed the last option to Hubs and since I had quite of few of those empty (imitation) milk crates lying around we decided that was the best option to try. That amazing Hubby of mine came up with this genius wooden frame built from leftover hemlock from our barn addition. Heml0ck is perfect for a project like this because it is very lightweight making this milk crate nesting box set up easy to move and clean. Step #1. Decide on the size. A good rule of thumb is 1 nesting box for every 4-5 hens. So if you have 20 chickens you will need at least 5 boxes. Step #2. Build a simple frame. Take a look around your property and see if you have any supplies you can use to create a simple framework to hold the milk crates. Something that will keep the crates from moving too much as the chickens go in and out to lay their eggs. More often than not, chickens will prefer one nesting box over another and that box will change every week or so. Don’t be surprised if your chickens all lay their eggs in one box ignoring another. To keep those eggs from tumbling out of the nesting box, you will need a sturdy framework holding them in place. Use the dimensions of the individual crates to build the frame. The crates slide in from the top and are held in pretty securely. 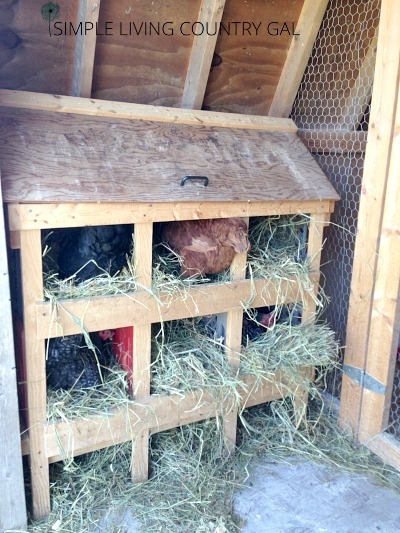 There is a small lip in front of each crate to keep the hay and the eggs neatly inside without risk of falling out. Step #3. Make it easy to clean. For our setup, we built a hinged lid that props open for easy cleaning. This allows the boxes to slide in and out for cleaning. 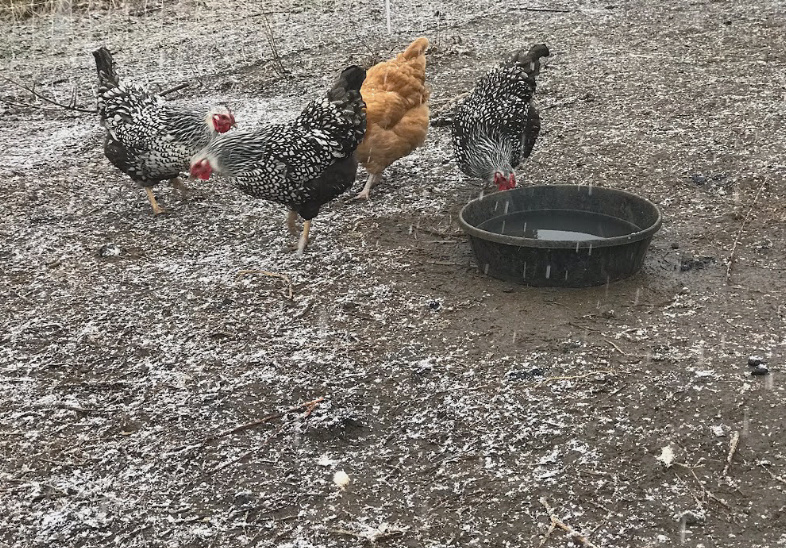 Just pull the boxes out, dump the bedding in the compost bin, and wash. A super easy way to disinfect and provide a clean place for your hens to lay their eggs. Another plus is the lid helps to keep any debris from falling down through the milk crates. The slant of the like also prevents the chickens from sitting on the very top to roost. Our set up holds 6 milk crates with room underneath for my more finicky gals. As I mentioned before, our hens have a crate they prefer over all the others. I will often find 5-6 eggs in one or more crates with no eggs at all in another! Once the boxes are in, it’s ready to go! Be sure to have some sort of bedding inside such as straw or hay. This will protect the eggs from the hard plastic and keep the inside of the crates a bit cleaner. I just love this design. The plastic crates are very easy to clean and the frame is extremely lightweight so I can move it in and out very easily by myself. 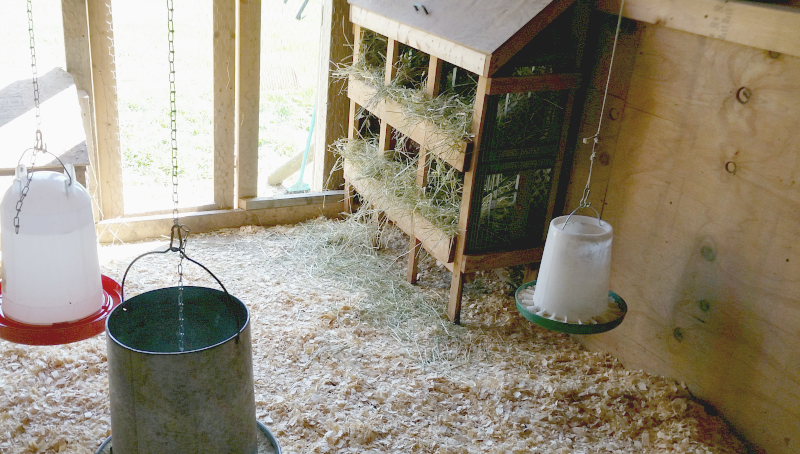 From day one the hens took to this setup and we really had no problems with them refusing to use it. Do not worry about it at all if your hens will use the boxes or not. They are drawn to a private and protected space when they feel the urge to lay an egg. It may take a day or two but they will eventually use the nesting boxes. This setup also works well for ducks since the lower milk crates are very close to the ground. Our ducks have no problem getting inside to lay. 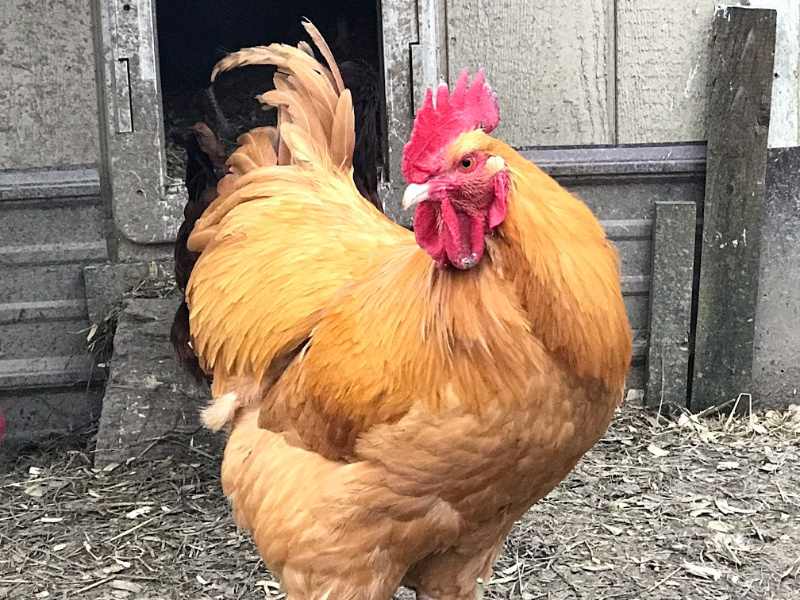 If you do have a hen or two that simply does not “get it”, you can keep a golf ball or plastic egg in one of the nesting boxes to help them figure it out. I have never had to do this since mimicking is a behavior of hens and they will often learn by seeing the others jump in and lay in the boxes. And there you have it, one chicken nesting area made mostly from supplies on hand and scrap wood. Total cost $4 since I did need to purchase two more (imitation) milk crates. Luckily I found them at a yard sale for $2 each. 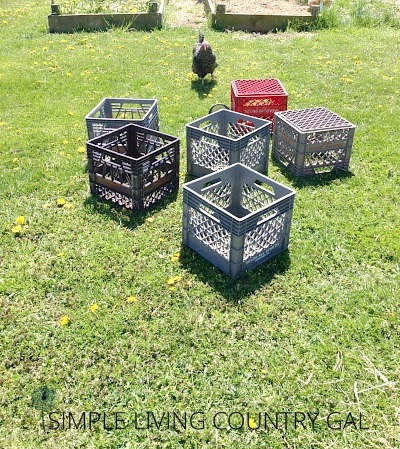 Plastic Milk Crates – You will need 1 crate for 4-5 hens. Spare wood for the frame – Build to the size of crates you hope to hold. Straw or Sawdust – Use inside of the boxes to protect the eggs. Basket – To safely collect eggs. When homesteading it is important to think outside of the box when starting a new project. Use it up, make do, or do without is a motto of mine and I just love the challenge of solutions without necessary trips to the store. 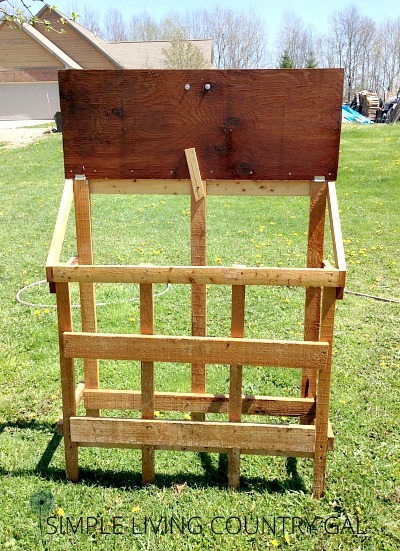 Do you have a DIY milk crate nesting boxes on your homestead? If so, how are they working for you? Where did you find the crates for sale? I found mine at a yard sale (of course! ), but if you google them you can find them as well. Amazon has them but they are uber expensive. I think I paid $1-$2 each for mine. A warning about milk crates. Some have a civil penalty on them if you have them. They are so handy for everything that people were stealing them and using them or selling them. The dairy started putting fines and other civil actions to curb their loses (the good ones are not cheap) I’m told it doesn’t matter if they are from a yard sale or from Amazon, if they are used milk crates make sure it isn’t stamped on them a warning about taking them. The one I found in a barn I was helping clean out says, “$1,500 fine if taken”. A couple years later I noticed it and called the dairy and made arrangements to return it. Yes, this is true, I think I should be more clear. I am talking about crates that look like milk crates but are NOT officially stamped milk crates. Sorry for the confusion and thank you for that valuable information!